This is a brilliant illusion discovered by Baingio Pinna of the University of Sassari in Italy. 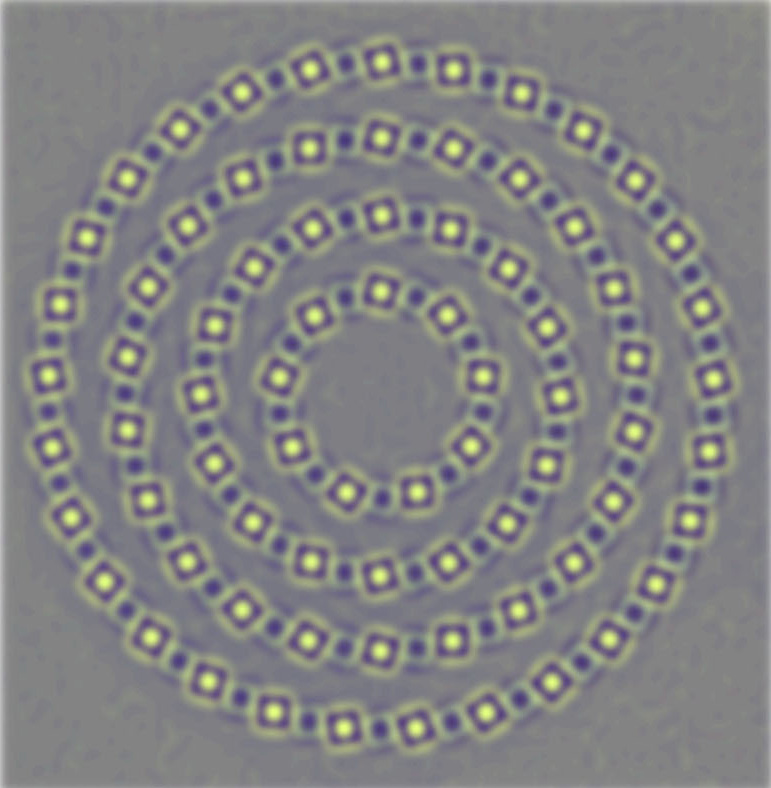 The circles appear to spiral and intersect, but are in fact an orderly set of concentric circles. 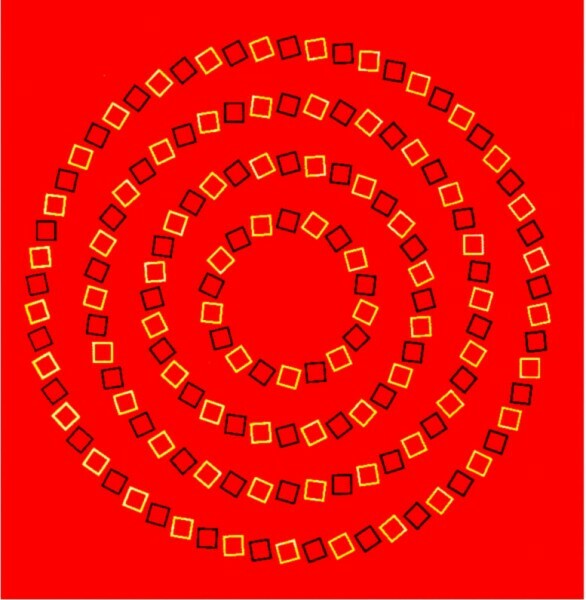 The illusion is due to the way the orientation of the squares alternates from circle to circle, and that contrast alternates from square to square within each circle. The illusion is related to the movement illusions of Akiyoshi Kitaoka and to twisted cord illusions. What’s going on is suggested by this next version, with the edges enhanced, plus a bit of blurring. This image approximates (with false colour) the data transmitted within the brain once the image has been filtered by cell systems early in the visual pathway, including centre-surround cell assemblies (a bit technical, that link). The role of these is to enhance edges, so that bright edges are now emphasised by dark fringes and vice versa. Note that between the little stacks of alternating light and dark fringes, along the line of the circles, the dark fringes of bright squares align with the dark edges of adjacent squares and vice versa. The scale and spacing of the squares is just right to get that alignment, and as a result the effect enhances the inward turning, spiralling effect due to the orientation of the squares. The fringes combine to give an effect a little like interfering waves. The illusion seems to be bamboozling processes that are usually superbly effective at filtering out the key information about edges and their orientation in the visual field. However, showing that centre-surround cell outputs could be enhancing the inward turning character of the lines forming the large circles doesn’t explain why the brain integrates the local effects into the perception that the large circles as a whole are spiralling inwards. I guess that’s because, to a much greater extent than we realise, we infer global configurations from what we see just in the central, foveal area of the field of view. That also seems to be the case with impossible 3 dimensional shapes, as in the impossible tribar.